The cocoa bean is just like wine grapes. Because it’s naturally grown, it is susceptible to changes in weather and climate – so each year’s crop is a different quality (or 'vintage'). Different types of soil will also affect the crop. How so? Experts recognise all kinds of flavours in the humble bean; don’t be surprised to encounter floral, caramel, or fruity undertones. Professional chocolate tasters make sure that they compare chocolates according to their cocoa content, so the only variables come from the cocoa itself. So start with a selection of 70% cocoa chocolates, and look for single-origin chocolate which is labelled with its country of origin. You can’t really tell that much from looking at chocolate. Well-made chocolates have a glossy finish (the result of proper tempering), and should not be dull or blistered with white (bloom). Is your mouth watering? Go ahead and snap off a piece. ‘Snap’ is the important word here. You’ll hear it over and over again in the world of chocolate tasting. It’s precisely the sound that your chocolate should make as it breaks, cleanly, and sharply. 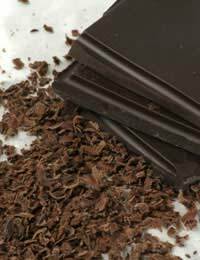 Crumbs or softness indicate a lower cocoa content – not always a bad thing, but if you’re tasting a dark chocolate, alarm bells should ring. Finally, put the piece of chocolate in your mouth, but don’t swallow just yet. Chew slowly and get a feel for the texture. Because cocoa butter melts at body temperature, bars made with a high proportion of cocoa butter should melt in your mouth. The melting chocolate should feel smooth – not grainy, and definitely not greasy. Too much cocoa butter will result in a thick chocolate that coats the inside of your mouth. Now check out the flavours. From dark chocolate, you’d expect harder flavours – toasty, bitter, earthy tones with a little nuttiness – whereas milk chocolate supplies soft flavour notes: floral, spicy, caramel notes, often also with nuttiness. Really serious about learning to listen to your tastebuds? You could attend a tutored tasting at some of the UK’s premier chocolatiers. Or you could take a self-tutored course... by joining a club. Chocolate clubs have become popular in the last couple of years. Premium chocolate suppliers such as Hotel Chocolat and Montezuma now offer monthly selections, which include tasting notes on your box of chocolates. Some chocolate clubs (like the 70% Club) source a variety of chocolates from different makers; some clubs offer chocolates from their chosen chocolatiers; and some make all the chocolate themselves. It’s really up to you which to choose, depending what you want to get from your membership. All of the packages arrive with tasting notes or newsletters, giving you an insight into the production and selection processes that take place behind the scenes. It’s not an urban myth, you know: many big stores and chains employ specialist chocolate tasters to select the next big thing. Additionally, some cake manufacturers and chocolatiers rely on a panel of part-time tasters – to whom samples are sent, and then feedback is collected before new products become available to the public.